After two years of abandoning my blog, I am finally ready to get back to it. My Internet persona, The Passion-ate, can rise again. I originally started my blog as an outlet for my passion of food. However, my obsession with food grew larger than my blog. I ended up changing careers paths from an account executive in the advertising world, to a full-time food styling and recipe development assistant. Let’s just say it was a big adjustment. My experience in the kitchen was limited and I did not know what I was in for. In my first few weeks working for my boss I managed to break his mini-chop, spice blender, and lose a bunch of his styling tweezers. While making a hot sauce, I foolishly deseeded ancho chilli peppers without wearing gloves. I’ve never experienced more excruciating pain. I went to bed with my hands in bowls of milk in attempt to relieve myself from the burning. Lastly, I had to perfect making cheesecakes for a Philadelphia advertisement. Over baked and the cheesecake will crack, under baked and it will be wet in the center. The only way for me to tell if my cheesecake was perfectly set and not under baked was to cut into it, which has to occur on set…right before it would be photographed. I didn’t sleep that week and when I did I was dreaming of wet cheesecakes. The workload made it very difficult to tend to my blog. When I had free time I wanted to mellow out on the couch. Also, working with super talented people who professionally style, photograph, and prop photo shoots gave me little confidence to continue what I was doing. I knew I had lots of learning to do before I put my own stuff out there for the world to see. With that said, I also came to the realization that if I don’t work at it I’ll never get better. So here I am blogging again. I know a bit more about the world of cookery and styling but I still have lots to learn but more importantly lots to share. Similar to my last blog (well this blog, before I deleted all my posts) I continue to focus on recipes that are healthy, mostly vegetarian, and approachable. I present to you Roasted Cauliflower and Chickpeas with a Preserved Lemon and Herb Dressing. This recipe makes a great side dish or a healthy lunch. Cauliflower is the ‘it’ ingredient right now and for good reason. It’s versatile and it can take on any flavour. This recipe is packed with flavour. The preserved lemon adds a level of depth to the dish and the herbs leave it tasting fresh. You can purchase preserved lemons at specialty or Middle Eastern grocery stores. Preheat the oven to 400° F. Line a baking sheet with parchment paper. 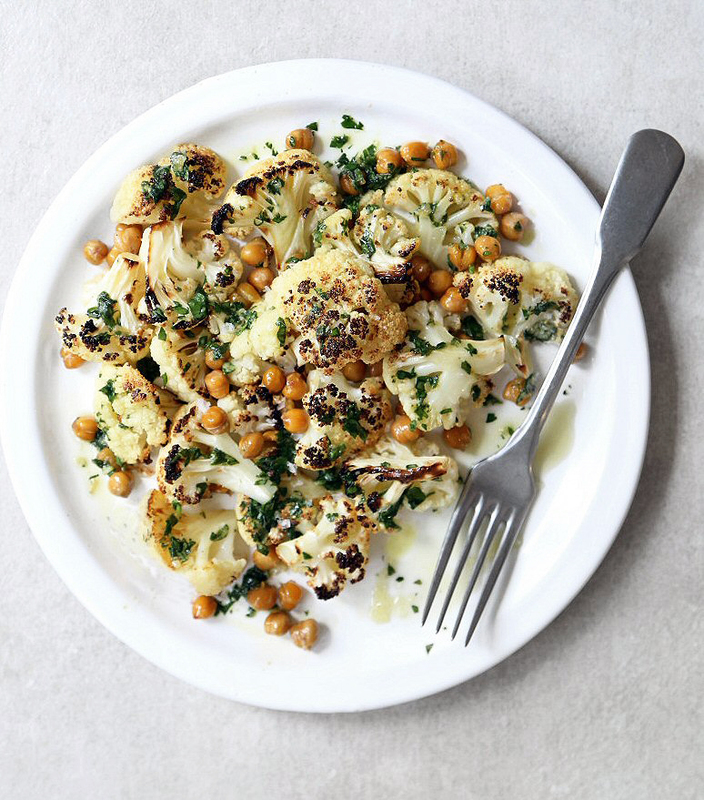 Arrange cauliflower and chickpeas on baking sheet, drizzle with 3 tbsp olive oil, and season with salt and pepper. Roast until cauliflower is tender and golden brown on top, about 30-35 minutes. Prepare the dressing. Combine the garlic, herbs, preserved lemon peel, white wine vinegar and remaining olive oil and whisk until blended. Season with salt and pepper. This entry was posted in Recipes, Starters/Sides and tagged cauliflower, easy, side dish, vegetable, Vegetarian. Bookmark the permalink.